‘Tis the season for holiday parties – both hosting and guesting. Conventional wisdome says you’re never supposed to arrive at a party empty-handed, and while a bottle of champagne is always a safe choice, if it’s a casual get-together, I like to ring to the host or hostess and offer to bring an easy party appetizer. 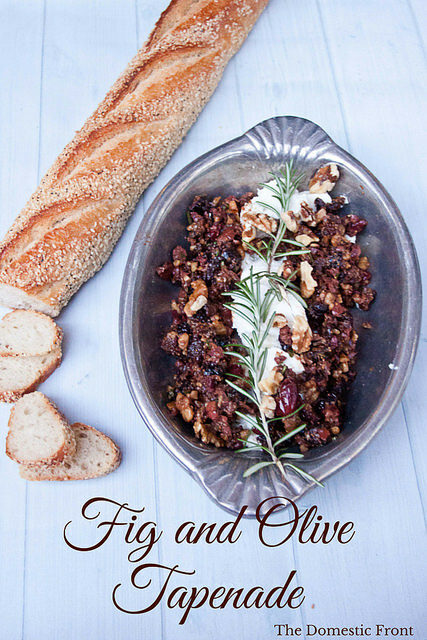 This fig and olive tapenade with rosemary and goat cheese is one of my favorites. Vegetarian, great served at room temperature, easy to make-ahead (and gluten free if you serve it with the right crackers) – this ticks all the boxes of ideal hors d’oeuvre for the holiday party. I got this recipe from my aunt, who brought it to my birthday party this year. It was so good everyone asked for the recipe, and I tweaked it a bit according to my own tastes (and ingredients I had on hand). Tapenade is traditionally a Provencal dish made with olives, capers and anchovies – it’s good, but very salty. This tapenade tempers the saltiness with the sweetness of dried figs and some tannins and crunch from walnuts. It’s a looser, coarser mixture than most tapenades, but the variations in flavor and texture make it that much more satisfying and addictive. This is wonderful served the way I’ve shown it hear – as an easy party appetizer with goat cheese bread and crackers. But the tapenade alone would also make a wonderful addition to sandwiches – I can imagine it paired with brie in a fancy grilled cheese, or as a complement to turkey or ham. In a little jar (with instructions to refrigerate), it would even make a great hostess gift! In a small saucepan, heat the figs with the wine over medium high heat until the liquid evaporates and has been absorbed, about 5 minutes. Combine the softened figs with the olives, olive oil, vinegar, rosemary and walnuts. Stir to combine. (If your mixture seems too loose or you've chopped your pieces too big, you can give it a few pulses in a food processor at this point). Mixture can be refrigerated for 3-4 days. Before serving, slice goat cheese into circles and arrange on serving dish. Garnish with rosemary halves and walnut sprigs. Serve at room temperature. Dried figs can be easier to chop with kitchen scissors instead of a knife. This is best when the goat cheese is at a soft room temperature instead of being served directly from the fridge. It’s mary –Christie & Adams friend. Lovely blog! Definitely going to try some of your recipes. I think that fig & olive tapenade is going to be a big hit up here on mt washington…….must try….